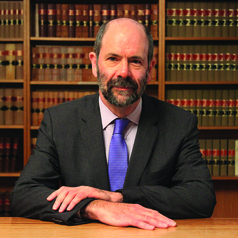 Donald R Rothwell is Professor of International Law at the ANU College of Law, Australian National University where he has taught since July 2006. His research has a specific focus on law of the sea, law of the polar regions, and implementation of international law within Australia as reflected in 22 books, and over 200 articles, book chapters and notes in international and Australian publications. Rothwell’s recent authored, co-authored or edited books include International Law in Australia 3rd (Thomson Reuters, 2017) edited with Crawford; The International Law of the Sea 2nd (Bloomsbury, 2016) with Stephens, and Rothwell, Oude Elferink, Scott and Stephens (eds), The Oxford Handbook of the Law of the Sea (OUP, 2015). Major career works include The Polar Regions and the Development of International Law (CUP, 1996), and International Law: Cases and Materials with Australian Perspectives 2nd (CUP: 2014) with Kaye, Akhtarkhavari and Davis. Rothwell is also Co-Editor of the Australian Year Book of International Law and Editor-in-Chief of the Brill Research Perspectives in Law of the Sea. Since 2012 he has been Rapporteur of the International Law Association (ILA) Committee on ‘Baselines under the International Law of the Sea’. He has taught a range of courses including Law of the Sea, International Dispute Resolution, International Law and Use of Armed Force, International Humanitarian Law, Military Operations Law, and Public International Law. Rothwell was previously Challis Professor of International Law and Director of the Sydney Centre for International and Global Law, University of Sydney (2004-2006), where he had taught since 1988. He has acted as a consultant or been a member of expert groups for UNEP, UNDP, IUCN, the Australian Government, and acted as advisor to the International Fund for Animal Welfare (IFAW). In 2012 Rothwell was appointed an inaugural ANU Public Policy Fellow, and in 2015 elected as a Fellow to the Australian Academy of Law. He is a regular media commentator on international law issues and has written over 100 opinion comments, including for all of the major daily newspapers in Australia and ABC Online ‘The Drum. His media interviews have included ABC TV 7.30, ABC Radio ‘AM’ and ‘PM’, ABC Radio National ‘Breakfast’, ABC News 24, Al Jazerra (TV), BBC World (TV), and the Voice of America.